I got the app last week, and noticed several inconsistencies. However, despite the “initial value” of the input element being pointed to two different qr code scanning elements, they both show the same value. This leads me to think , that despite pointing to a different element, it points to the same one. When there are multiple qr code elements, the action “start live decoder” triggered by a button, becomes inconsistent and may not work. I think this has to do with bubble not being able to identify the element to which the run the action. Reset data cannot point to qr element. Nor does putting it in a group, or in a popup then having reset the element’s data resets it. This is important because I would like the scanner to but turned off, or popup shut off, when a result data of the element is changed. As it is now, I can’t use this element live in my apps because I don’t know when the element works, and when it doesn’t, when bubble can point to it, and when it can’t. I see you’re using two different QR Elements for different scan button actions, right? Have you tried using one single QR element for both scan actions? And maybe delimit these actions with conditions regarding your needs. Maybe use the demo page - https://zeroqode-demo-07.bubbleapps.io/qr-bar_code_reader as reference since it shows the representative use case. Thanks for your reply. Yes I managed to get it to work through using a single qr scan element. 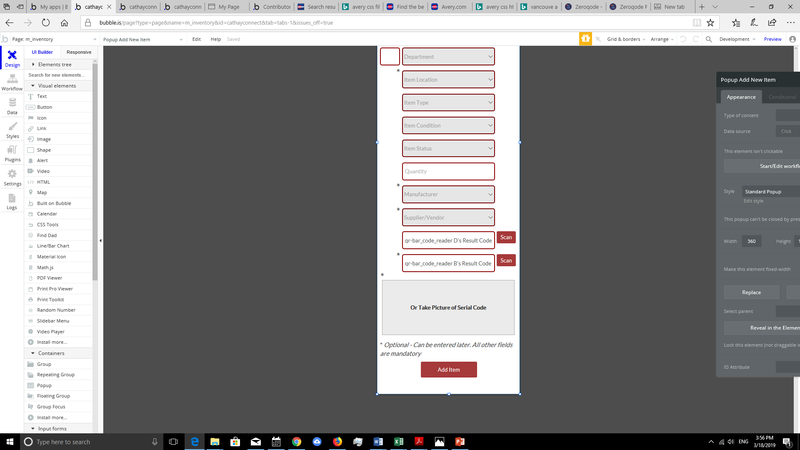 But because I need to the data to display different on two different input elements as I’m using the result code to do different things, I had to do some weird workflows by changing different fields in current user. So i managed to make it work, but it would be great if these inconsistencies would work out or make it so that we simply can’t put more than one of these qr elements on the page because to save us the time of trouble shooting. Glad that you made it work for your case. However this may be more of general thing of how Bubble works with plugin, rather than plugin bug or issue.